We are seeing more and more instances of violence in our society and we know that violence starts with disrespect. Rosie Batty started campaigning some years ago after losing her son to family violence to ensure we better educate our children so they don’t grow up to be perpetrators or victims. Evidence presented to the Royal C​ommission into Family Violence was clear, that school-based prevention is the best method to reduce the incidence of family violence. The recommendations handed down by the Royal Commission as part of this report said that that school-based efforts are needed as a long-term prevention strategy. 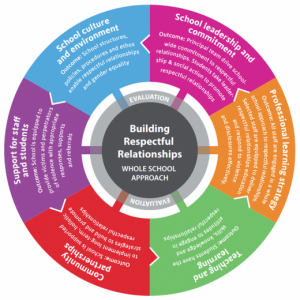 The Royal Commission into Family Violence specifically recommended the Victorian Government mandate the Respectful Relationships program into all primary and secondary schools. As a result the Dept of Education in consultation with reputable organisations such as Our Watch and other specialists produced the Resilience, Rights and Respectful Relationships program for all Primary and Secondary schools. Yarra Hills was lucky enough to be one of the first schools to pilot this program 4 years ago. The Resilience, Rights and Respectful Relationships is now embedded within our Health curriculum in all year levels to build the social and emotional skills of all students. The aim throughout this program is to prevent gender stereotyping and promote gender equity as well as the respectful relationships needed to prevent family violence. Improving resilience was recently introduced to the program to assist students to understand emotional literacy, personal strengths, positive coping, problem-solving and stress management. This section of the program is now included in all Life Skills classes of year 7 – 10 students as well as the Aspire program in year 11 – 12. By raising the awareness of gender equity and ensuring that every child has equal opportunity in leadership, sport, drama, classroom activities, careers as well as accepting this equality is a positive step forward to preventing family violence in the future.